[By Nick] It looks like it’s time for a review of a product that got overlooked a couple of years ago when it was released. 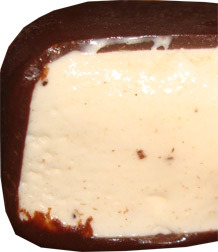 The Magnum Dark Chocolate ice cream bar was among the original Magnum bars that were introduced to the U.S. market in 2011. It’s pretty straightforward in composition seeing as its just vanilla bean ice cream that has been dipped in dark Belgium chocolate, 60% cacao if you want to be exact. It is the only bar they offer here in the states that uses their dark chocolate instead of the typical milk chocolate (though they do have a white chocolate version that we'll review at some point). I really like the shiny gold wrapper that each bar comes in. It sort of gives off an elegant, superior feel as if to say “this bar is clearly greater than any other bar in the supermarket”. Removing the wrapper and you’re greeted with a substantially sized bar. You can tell by the color that it’s not your normal milk chocolate coating. After taking a bite, you’re first hit with a punch of bitter, semisweet chocolate. That initial bitterness is then put in check by the silky smooth vanilla bean ice cream. The ice cream isn’t really much to talk about. The flavor is just a basic vanilla with no intensity and just all around non offensive. The ice cream is pretty much playing second fiddle to the dark chocolate. The coating isn’t as intensely dark as I had hoped but it’s not your commercial “dark” chocolate either. I could easily see people being turned off by it alone but once its mixed in with the ice cream it becomes a more balanced bar. I do wish the ice cream packed more of a punch like the shell does but it still seems to work out nicely. It’s not too sweet yet not too bitter either. The shell also provides a nice crunch and almost a chew if you let it melt slowly. 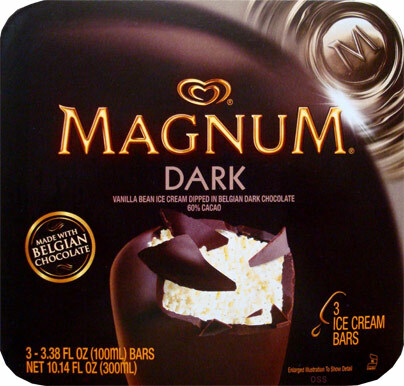 I also noticed that the shell doesn't seem quite as thick as the other varieties of Magnum bars I have tried in the past. I’m not sure if they did this because they thought too much dark chocolate might overwhelm the ice cream or what but it’s just something that might be of note. All in all this is a solid bar. Verdict? Not as dark or vanilla as I would want but still all around good.